We dropped-in after lunch yesterday at Last Days of Autumn Brewing on Magnolia Avenue. No, it was not for a libation, but rather to see what was happening on the first day of “Co-Work Week” in Knoxville. The venue had agreed to be open from 9 a.m. to 5 p.m. as part of an experiment being run by Daniel Hodge and Miles Biggs, Founders of Joule Desk, to assess the feasibility of turning underutilized venues like Last Days of Autumn Brewing into co-working spaces. As noted in our recent teknovation.biz article, the idea is to help these types of venues generate additional revenues since they frequently have one or two employees onsite during the day before opening in late afternoon. 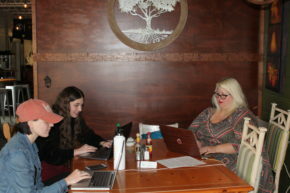 When we visited yesterday, we found Chyna Brackeen, President of Attack Monkey Productions, and two of her employees busily at work at a table in the front of the building. Founded in 2008, Attack Monkey is a full-service entertainment firm specializing in artist management and consulting, event and festival production, marketing, and public relations. Brackeen says it is best known for its work with Knoxville’s annual Rhythm N’ Blooms Festival. So, why was Brackeen working there? She explained that she is relocating offices and needed an interim place to work. When she heard about “Co-Work Week,” Brackeen decided to give it a try. She seemed pleased and said she would probably be at Last Days of Autumn Brewing all week. Hodge was also upbeat midway through the first of five days. He said more than 40 individuals have responded to participate throughout the week. He shared with us one-page flyers with frequently asked questions – one from a venue host’s perspective (JouleDesk Host FAQ) and the other from a user’s viewpoint (JouleDesk User FAQ). 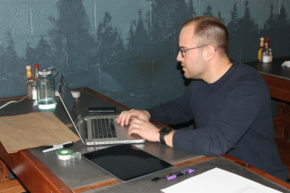 Pictured below are Hodge at work (left) at a table at Last Days of Autumn Brewing while Brackeen and two of her colleagues work at another table in the right photo. They are Cailey Fain (back left), a University of Tennessee, Knoxville student intern; Aubrey Mullins (left front), and Brackeen.